Nigeria’s historic Skeleton Athlete, Simidele Adeagbo, hit the Ice last week in Lake Placid, New York, as she kicked off preparation for the new season. 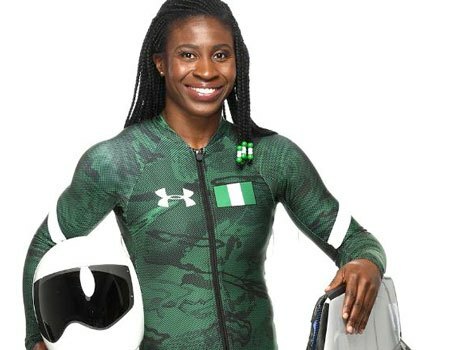 Adeagbo made history with the Bobsled Team in Pyeongchang, South Korea, where Nigeria debuted at the Winter Olympics, in February 2018. Speaking on her preparation: Adeagbo said: “It’s great to make my return to training on ice in Lake Placid. I have fond memories from racing on this track last season and I’m looking forward to making awesome new memories here as I start the journey to Beijing 2022”. Adeagbo has been at the Skeleton Developmental Training, Mt. Van Hoevenberg, Lake Placid, New York, since November 12 and completed the first phase of her programme, on November 21. Interestingly, her first race opens up a few days later at the North America’s Cup Race #5 & Race #6, respectively. Both races are scheduled for November 30 and December 1. Last season, in January, she had an impressive 3rd place finish in both of her races, on this same track, which still stands as her strongest finish in the sport. Adeagbo entered the history books as the first African female skeleton athlete when she debuted at the Pyeonchang Games earlier in the year.